The concept behind this amazing new crossover from Volkswagen is pretty simple. Take the Golf SportWagen, add a few body embellishments, all-wheel drive, a couple of traction enhancements, and lift the suspension to give it a little more ground clearance. That’s all it takes to create the 2017 Volkswagen Golf Alltrack, a crossover that comes with 66.5 cubic feet of cargo space with the rear seats folded down. When you add in a powerful turbocharged four-cylinder engine and an exceptionally comfortable interior, you get what can only be described as an outstanding crossover with a sleek station wagon look. Tucked neatly away under the hood of the Alltrack is a turbocharged 1.8-liter inline four-cylinder engine that boasts a healthy 170 horsepower and puts out 199 pound-feet of torque. All of this power is transferred to the all-wheel drive system via a six-speed dual clutch automatic transmission with silky smooth shifting. In fact, it shifts so smoothly, the only way you really know you have changed gears is by watching the tachometer. The suspension upgrades lift the Alltrack and give it a full 6.7 inches of ground clearance to help you clear rocky terrain. While this might not be quite as much ground clearance as some of its competitors, you can take your VW off road without having to worry about damaging the underside. This is more than enough clearance for the average driver. While the base versions are quite comfortable and offer a lot of room for everyone, the upgraded SEL offers nicely padded seating that easily rivals any other vehicle in this class. The controls are laid out in a sensible user-friendly manner that makes them very easy to use. There is nothing fancy in the instrument cluster, just good solid German logic in the layout and readability. Going with the trend, the front flip down ashtray has been replaced with a nifty shelf that is perfect for your cell phone and includes a USB port and an auxiliary jack that let you connect your phone to the audio system. This system has been optimized for use with both Apple CarPlay and Android Auto. It also lets you use streaming apps like Tunein Radio, Pandora, and Spotify as well as stream directly from your phone via Bluetooth or direct connection. 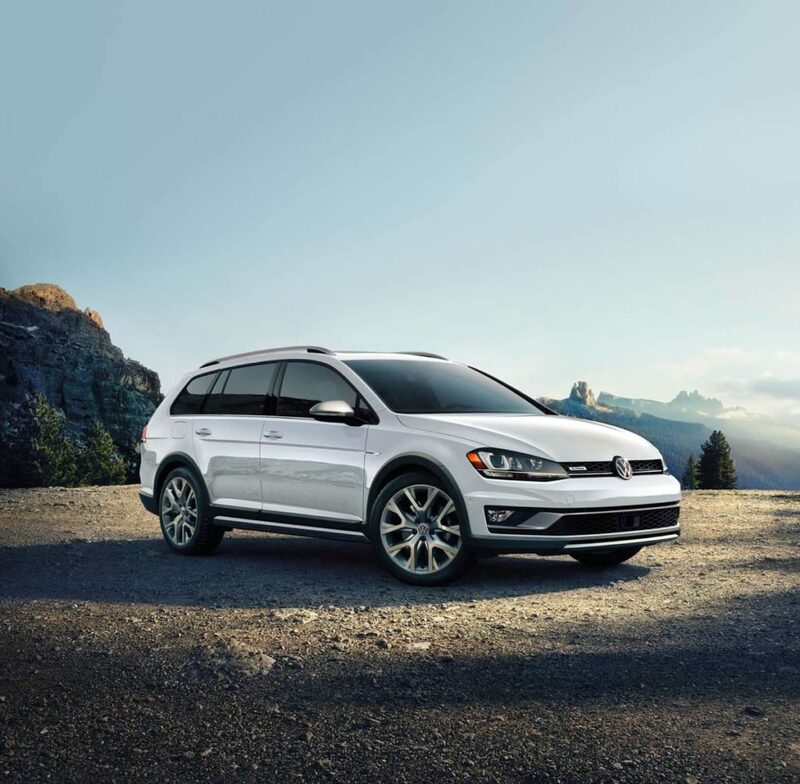 With the rear seats in the upright position, the VW Golf Alltrack offers 30.4 cubic feet of storage space that converts into a massive 66.5 cubic feet with the seats down. Bumper to bumper the 2017 Volkswagen Golf Alltrack offers serious buyers a well-equipped crossover that will take you anywhere you need to go. If you would like to learn more about the new Volkswagen Golf Alltrack, come and take one for a test drive at Durham VW. Call us at (919) 493-7411 to schedule your appointment today or come on in and see one for yourself.